Probably built after the fire of 1870 that destroyed much of Red Jacket Village, originally 512 Portland street was a residence on edge of town. The Village expanded around it creating a prime business location. The building was held apartments upstairs and businesses on the first floor and in the basement. In 1910 it housed 5 families, (23 total residents) and a saloon. Over the years (from 1898-1930) it was home to a variety of businesses; saloon, barber shop, soda parlor and gunsmith. 512 Portland Street is one of Calumet's oldest extant buildings. 512 Portland Street circa 1935. In more recent times the building was used strictly as a residence and changed hands a number of times. Maintenance was left undone and the building fell into a state of disrepair and came to the Village of Calumet DDA, the current owner, through tax sale. 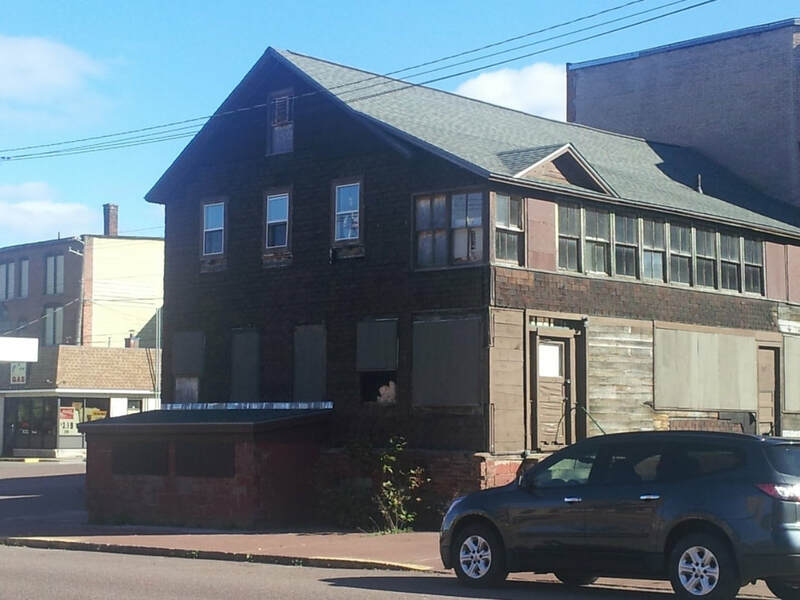 A local group, called the Bring Back Calumet Taskforce (BBCT), focused on stabilizing historic structures in Calumet was able to secure grant funding to stabilize the building in 2017. Just over $43,000 was spent to replace the roof and correct structural issues in the basement. The building is now "buttoned up" and watertight. 512 Portland Street is ready for redevelopment. A few resources have been assembled below to help guide prospective buyers. INTERESTED IN PURCHASING THIS PROPERTY? The DDA has taken on ownership and stabilization of several buildings in an effort to prevent the loss of historic buildings and avoid further fragmentation of the downtown business district. It is therefore the policy of the DDA to hold these buildings until a viable development opportunity is found that will return these buildings to a condition and use that benefits the long term economic health of Calumet. To evaluate potential buyers the DDA utilizes a purchase proposal process. The proposal guideline can be accessed by following the link below or by contacting the Village of Calumet.